AlphaNinja - Cisco (CSCO) reported last night. Typical for the company, they beat earnings by a couple pennies, then made the world wait for the guidance portion of the conference call, in which John Chambers said the bottom is hopefully behind us, but offered tempered (yet in line with expectations) guidance for the next quarter. As has been the case with many companies, the earnings beat was due to cost cuts, rather than a top-line (revenue) surprise. Taking a step (way) back -->> back in the tech collapse of 2001, Cisco was one of the last firms to admit things were falling off a cliff. The talk in trading rooms (including the one I was in) was "sure - Juniper, Ciena, everybody's tanking, but Chambers and Cisco will hold up." They weren't invincible then, and they aren't today. Two years ago, the "earth moved" when Chambers dramatically raised Cisco's long-term revenue growth target from a range of 10-15% to 12-17%. People freaked, and discussions of a massive "multiple expansion" were rampant -->> by that I mean instead of people giving CSCO a 17 P/E they thought it might warrant a 21 P/E due to the higher growth. 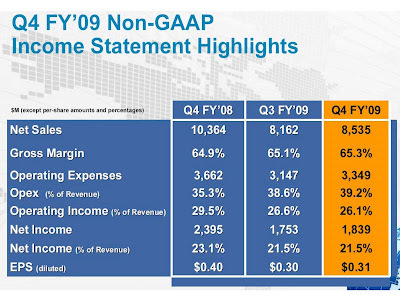 Now, Cisco is guiding for revenue to be down 15% in 2010. They're no less immune to global recessions than anyone else, and Chambers ALWAYS points that out on his conference calls, stating that their growth will be closely tied to GDP. Still, people expect miracles from these guys. The WSJ has a great piece out today talking about problems with decision making at Cisco, where they now have "59 internal standing committees." "Mr. Chambers's approach flies in the face of the management styles adopted by most companies of Cisco's size, which typically try to streamline operations and focus more narrowly on priorities. "Right now it's chaos because there's so much on everybody's plate," said Geoffrey Moore, a management consultant who has worked with Cisco." Although I haven't seen many upgrades, most street analysts today are increasing their Cisco price targets to the $26 range, about 18% higher than where the shares are now. Not long ago, the shares fetched $34, and I'd say the company's future outlook is no worse than it was then. Cisco has about $35billion in cash and investments, or $7 per share. Fiscal 2010 (ending next July)Free Cash Flow looks to come in about $7.4billion, and about $8.4billion the year after -->> an FCFY of 8-9%. Not bad, but not dirt cheap like it was in March. Short term, I'd wait for a pullback, but for 12months and longer, the shares are a great value. Dollar General files for an "IPO"
Details of the just-released inventory data.